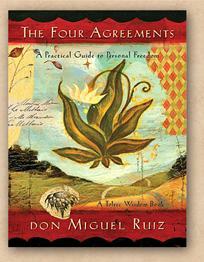 The Four Agreements by Don Miguel Ruiz……. The Four Agreements is not a new book. In fact, it debuted 15 years ago and has been on the New York Times Bestsellers List for over 7 years. The author is celebrating the book’s fifteen-year anniversary by publishing an illustrated version. And it is lovely. The author reminds us of fundamental truths that can change our perspective and increase our satisfaction with our lives. Perspective is everything. He encourages us to stay away from gossip, which he poetically calls poison, and not to worry so much about what others think of us. He reminds us that very often what people think of us is truly just a reflection of how they view themselves. The gentle ideas in the book are so basic but are also easy to slip away from. Honestly, there were a few places in the book where I felt like I was reading in circles. But I think that is because the ideas are so important and simple that the author wanted to stretch them out for emphasis. I will absolutely re-read this book periodically to remind myself to keep things in perspective and to not take things personally. And, seriously, this book would make a fantastic gift. ← Love from the Other Side by Carol Shimp………. Found book on Ocean Tug. Read book in one 12 hr. Watch,reread book 2 more times,This was about a year ago ,while running as master sailing in Gulf of Mex. I wish we could teach all our childern the messCaptage of the 4 im this book mankind might then have a hope for a future….God bless.